More than 60 miles of TART Trails serve recreation seekers and commuters in the Traverse City, Michigan area. Clarifying this expansive network through thoughtfully programmed signs is essential to helping TART achieve their safety, accessibility and usefulness goals. 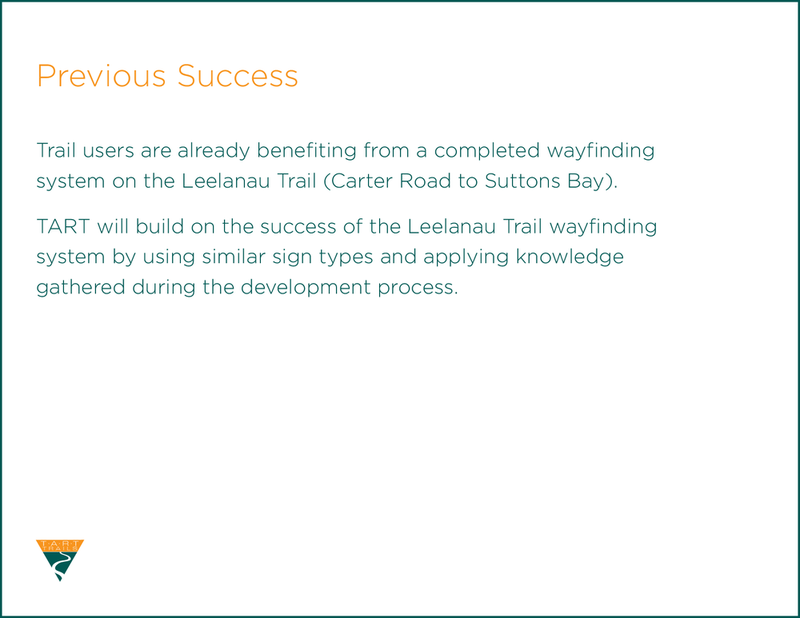 Knowing that community input is key to the success of a trail wayfinding system, I worked with TART to develop this presentation to reach out to stakeholders. Different groups have different needs and expectations. 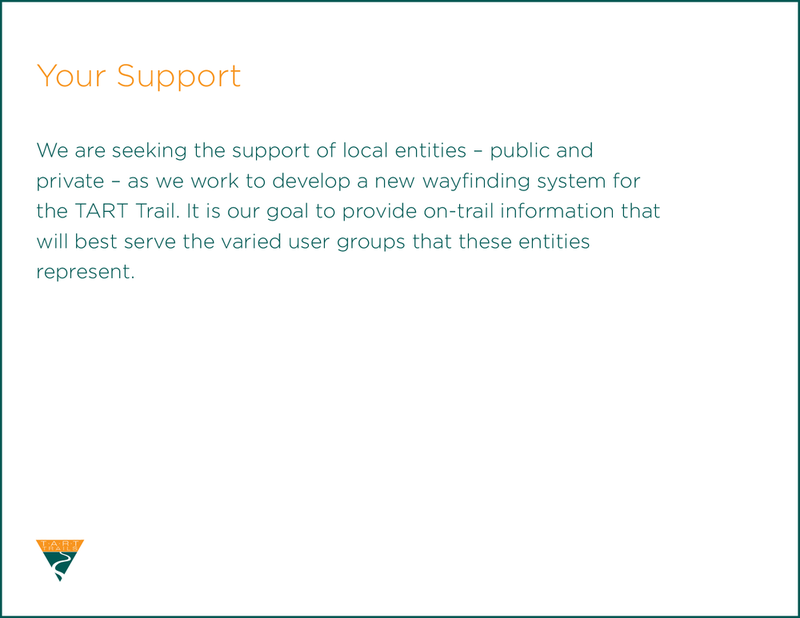 Out of owners, daily commuters, local business owners, parks managers and recreational users all lent their unique points of view – strengthening the system's design. Site surveys allow me to fully understand physical factors – sight lines, traffic flow, etc. – that will influence the functionality of the finished signs. 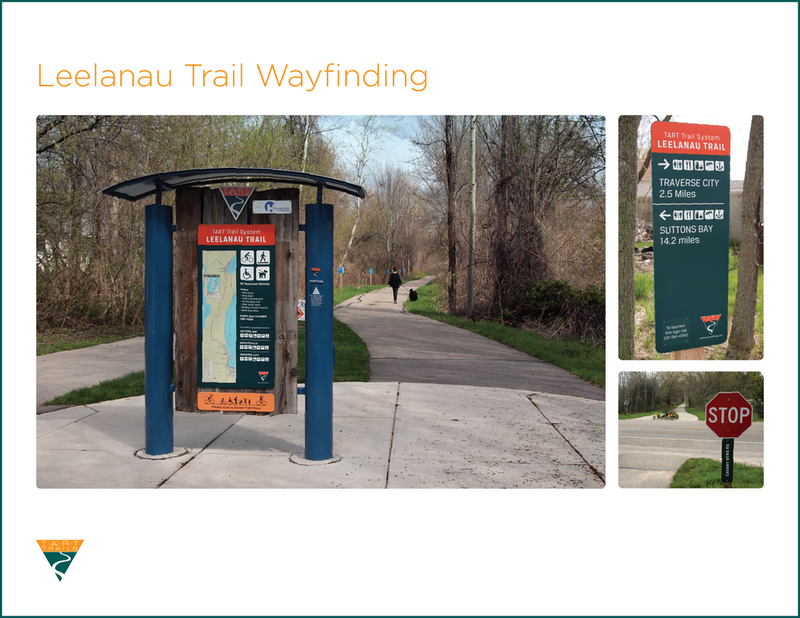 This project spanned 20 miles of trail. I used a car, a bike and skateboard in addition to walking to cover all that ground in the most efficient manner. A clearly designed sign location plan is helpful in showing how individual signs relate to the larger area and other signs in the system. A tidy sign message schedule helps all collaborators track not only messaging but notes, site conditions and installation instructions. Crystal clear design intent drawings communicate expectations to potential fabricators.